Thenkuzhal or Thenguzhal is one of the varieties of murukku. Murukku is a Tamil word which means twisted. Murukku got this name of because it’s twisted shape. 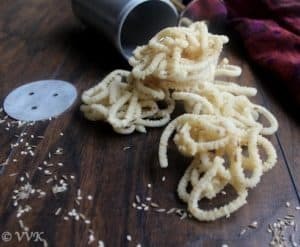 There are different varieties of murukku like mullu murukku, kai murukku, coconut milk murukku, manapaarai murukku etc. 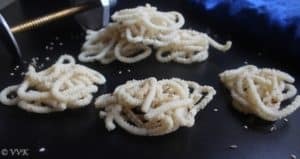 Thenkuzhal is a light and crispy murukku prepared with rice flour and urad dal flour and the main thing is, this murukku is white it color when compared to the other ones which are brown and golden brown. No chilly powder is required for this murukku. 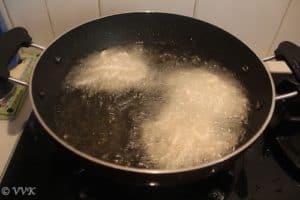 It’s interesting that I haven’t posted any fried recipe so far. But don’t worry. I have two more fried recipes coming up. This is my mother in laws recipe. This Thenguzhal of hers is very popular in my friends circle in US. 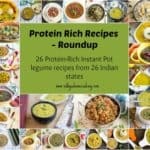 Whenever she is here our friends will ask her to prepare this for sure. 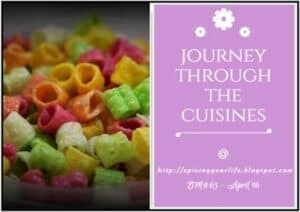 Traditionally it is prepared with homemade rice flour. 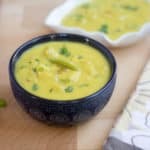 But again to make the process simple, she tried with store-bought rice flour and homemade urad dal flour. Vaandu loves it a lot and so obviously I had to learn it from her. Water – 1/2 cup or as required. 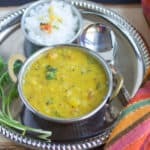 Dry roast 1 cup of urad dal till they turn light golden brown and let it cool. Then dry grind them into a fine powder. This roasted urad dhal powder is required for murukku, thattai and also for seedai. 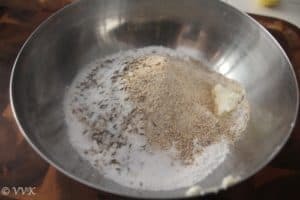 Mix the rice flour, urad dal flour, jeera, hing, cumin seeds, white sesame seeds, salt, coconut oil and butter together without any lumps. Sprinkle the half cup of water on needed basis and knead the dough. It should not stick to the vessel and knead the dough into a big ball. Meanwhile heat the oil for frying. Once the oil is hot turn it to medium heat. Grease the mold and the press with oil. 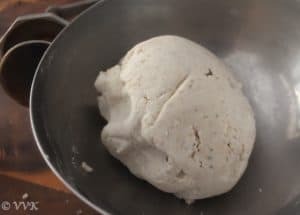 Take a sufficient quantity of dough or a handful and insert into the press. I directly pressed it into the oil. You can also press the murukku in an oil greased banana leaf or Ziploc and drop into oil. Remove the murukku from oil and place in the paper towel to remove the excess oil. Proceed like above for the remaining dough. 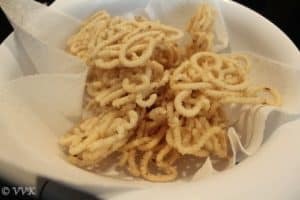 You can add daliya powder / pottukadalai podi for crispier murukku. 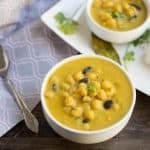 Too much of urad dal powder might change the color. While frying the murukku, make sure the heat is in medium or medium low. 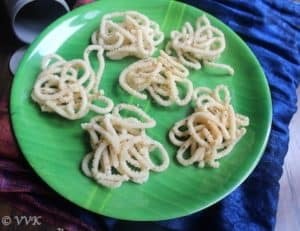 Thenkuzhal is a light and crispy murukku prepared with rice flour and urad dal flour and the main thing is, this murukku is white it color when compared to the other ones which are brown and golden brown. No chilly powder is required for this murukku. We get 8oz butter sticks here and the wrapper has the marks for every one oz. So it was easy for me to cut. 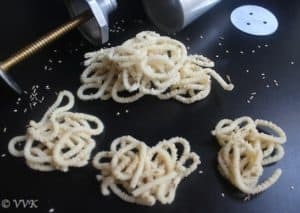 Crunchy and tasty snack .Looks wonderful. Beautifully made muruku Srividhya. Loved the texture and color you got there! Crispy and addictive snack for sure. Very crispy and addictive snack.. Thanks Gayathri and yes very true. 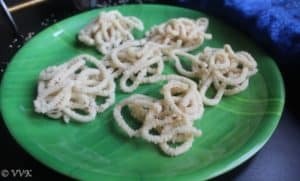 Crispy crunchy thenkozhal,such an addictive snack. You got the perfect colored thenkuzhal. We are also great fans of these murukku. White muruku is beautifully made. Looks like an addictive snack. I dont mind munching these crispy beauties. My all time favourite murukkus, love it to the core. Me too. Thanks a lot Priya. Thanks a lot and welcome to my space. Hopping on to yours now.